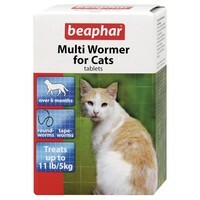 Beaphar Multi Wormer for Cats is a fast action 3 week treatment for roundworms and tapeworms. This effective multi wormer treatment is easy to administer and is effective against all common species of roundworms and tapeworms that are found in domestic cats. Treating cats up to 5kg in weight, these wormer tablets are only suitable for cats over 6 months old.